Parrots, also known as psittacines (/ˈsɪtəsaɪnz/), are the 402 species of birds that make up the order Psittaciformes, found in most tropical and subtropical regions, of which 387 are extant. 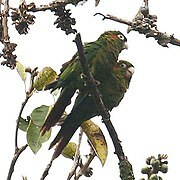 The order is subdivided into three superfamilies: the Psittacoidea ("true" parrots), the Cacatuoidea (cockatoos), and the Strigopoidea (New Zealand parrots). Parrots have a generally pantropical distribution with several species inhabiting temperate regions in the Southern Hemisphere as well. The greatest diversity of parrots is in South America and Australasia. The Cacatuoidea are quite distinct, having a movable head crest, a different arrangement of the carotid arteries, a gall bladder, differences in the skull bones, and lack the Dyck texture feathers that—in the Psittacoidea—scatter light to produce the vibrant colours of so many parrots. 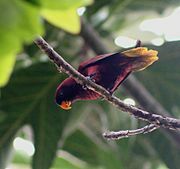 Lorikeets were previously regarded as a family, Loriidae,:45 but are now considered a tribe (Loriini) within the subfamily Loriinae, family Psittaculidae. Some species, such as the Puerto Rican amazon (Amazona vittata) have had a population bottleneck (in this case reduced to 13 individuals in 1975) and subsequently have low genetic variability and low reproductive success, leading to complications with conservation. No consensus existed regarding the taxonomy of Psittaciformes until recently. The placement of the Strigopoidea species has been variable in the past. They were once considered part of the Psittacoidea, but recent 21st-century studies place this group of New Zealand species as their own superfamily next to the Cacatuoidea and remaining members of the Psittacoidea. Many studies have confirmed the unique placement of this group at the base of the parrot tree. Most authors now recognize this group as a separate taxon containing two families: Nestoridae and Strigopidae. Conversely, the relationships among various cockatoo genera are largely resolved. Conservation status codes listed follow the International Union for Conservation of Nature (IUCN) Red List of Threatened Species. Range maps are provided wherever possible; if a range map is not available, a description of the bird's range is provided. Ranges are based on the IUCN red list for that species unless otherwise noted. All extinct species listed went extinct after 1500 CE (recently extinct), and are indicated by a dagger symbol "†". The order Psittaciformes consists of 387 extant species belonging to 87 genera. The following classification is based on the most recent proposals as of 2012. ^ This species might be extinct in the wild. ^ This parrot is considered a member of the genus Psittacula by the IOC since 2007, but as a member of the genus Lophopsittacus by the IUCN. ^ "Psittacine". American Heritage Dictionary of the English Language (4th ed.). Houghton Mifflin Company. 2000. Archived from the original on 27 August 2007. Retrieved 12 August 2016. ^ "Psittacine". Merriam-Webster Online Dictionary. Merriam-Webster, Inc. Retrieved 12 August 2016. ^ a b c d e Joseph, L.; Toon, A.; Schirtzinger, E. E.; Wright, T. F.; Schodde, R. (2012). "A revised nomenclature and classification for family-group taxa of parrots (Psittaciformes)" (PDF). Zootaxa (3205): 26–40. ^ Forshaw, J. M.; Cooper, W. T. (1981). Parrots of the World (2nd ed.). London, England: David & Charles, Newton Abbot. ISBN 978-0-7153-7698-0. ^ Cooke, F.; Bruce, J. (2004). The Encyclopedia of Animals: a complete visual guide (1st ed.). Berkeley, California: University of California Press. p. 296. ISBN 978-0-520-24406-1. ^ Heatley, J. J.; Cornejo, J. (2015). "Psittaciformes". In Miller, R. E.; Fowler, M. E. (eds.). Zoo and Wild Animal Medicine. 8. St. Louis, Missouri: Elsevier Saunders. p. 172. ISBN 978-1-4557-7397-8. ^ Forshaw, J. M.; Cooper, W. T. (1978) . Parrots of the World (2nd ed.). Melbourne, Australia: Landsdowne Editions. ISBN 978-0-7018-0690-3. ^ a b c d e Wright, T. F.; Schirtzinger, E. E.; Matsumoto, T.; Eberhard, J. R.; Graves, G. R.; Sanchez, J. J.; Capelli, S.; Muller, H.; Scharpegge, J.; Chambers, G. K.; Fleischer, R. C. (2008). "A Multilocus Molecular Phylogeny of the Parrots (Psittaciformes): Support for a Gondwanan Origin during the Cretaceous". Molecular Biology and Evolution. 25 (10): 2141–2156. doi:10.1093/molbev/msn160. PMC 2727385. PMID 18653733. ^ a b c d de Kloet, R. S.; de Kloet, S. R. (2005). "The evolution of the spindlin gene in birds: Sequence analysis of an intron of the spindlin W and Z gene reveals four major divisions of the Psittaciformes". Molecular Phylogenetics and Evolution. 36 (3): 706–721. doi:10.1016/j.ympev.2005.03.013. PMID 16099384. ^ a b c Tokita, M.; Kiyoshi, T.; Armstrong, K. N. (2007). "Evolution of craniofacial novelty in parrots through developmental modularity and heterochrony". Evolution and Development. 9 (6): 590–601. doi:10.1111/j.1525-142X.2007.00199.x. PMID 17976055. ^ Brock, M. K.; White, B. N. (1992). "Application of DNA fingerprinting to the recovery program of the endangered Puerto Rican parrot" (PDF). Proceedings of the National Academy of Sciences. 89 (23): 11121–11125. Bibcode:1992PNAS...8911121B. doi:10.1073/pnas.89.23.11121. ^ Sibley, C. G.; Ahlquist, J. E. (1991). Phylogeny and Classification of Birds. Yale University Press. ^ Christidis, L.; Boles, W. E. (2008). Systematics and Taxonomy of Australian Birds. Canberra, Australia: CSIRO Publishing. p. 200. ISBN 978-0-643-06511-6. ^ Homberger, D. G. (2006). "Classification and the status of wild populations of parrots". In Luescher AU (ed.). Manual of parrot behavior. Ames, Iowa: Blackwell Publishing. pp. 3–11. ISBN 978-0-8138-2749-0. ^ a b White, N. E.; Phillips, M. J.; Gilbert, M. T. P.; Alfaro-Núñez, A.; Willerslev, E.; Mawson, P. R.; Spencer, P. B. S.; Bunce, M. (2011). "The evolutionary history of cockatoos (Aves: Psittaciformes: Cacatuidae)". Molecular Phylogenetics and Evolution. 59 (3): 615–622. doi:10.1016/j.ympev.2011.03.011. PMID 21419232. ^ Astuti, D. (2004). "A phylogeny of cockatoos (Aves: Psittaciformes) inferred from DNA sequences of the seventh intron of nuclear β-fibrinogen gene" (PDF). Graduate School of Environmental Earth Science, Hokkaido University, Japan: 1–3. ^ Adams, M.; Baverstock, P. R.; Saunders, D.A. ; Schodde, R.; Smith, G. T. (1984). "Biochemical systematics of the Australian cockatoos (Psittaciformes: Cacatuinae)". Australian Journal of Zoology. 32 (3): 363–377. doi:10.1071/ZO9840363. ^ "Introduction". IUCN Red List of Threatened Species. Retrieved 12 August 2016. ^ Schweizer, M.; Seehausen, O.; Güntert, M.; Hertwig, S. T. (2009). "The evolutionary diversification of parrots supports a taxon pulse model with multiple trans-oceanic dispersal events and local radiations". Molecular Phylogenetics and Evolution. 54 (3): 984–994. doi:10.1016/j.ympev.2009.08.021. PMID 19699808. ^ Joseph, L.; Toon, A.; Schirtzinger, E. E.; Wright, T. F. (2011). "Molecular systematics of two enigmatic genera Psittacella and Pezoporus illuminate the ecological radiation of Australo-Papuan parrots (Aves: Psittaciformes)". Molecular Phylogenetics and Evolution. 59 (3): 675–684. doi:10.1016/j.ympev.2011.03.017. PMID 21453777. ^ Schweizer, M.; Seehausen, O.; Hertwig, S. T. (2011). "Macroevolutionary patterns in the diversification of parrots: effects of climate change, geological events and key innovations". Journal of Biogeography. 38 (11): 2176–2194. doi:10.1111/j.1365-2699.2011.02555.x. ^ International, B. (2016). "Cyanopsitta spixii". The IUCN Red List of Threatened Species. IUCN. 2016: e.T22685533A93078343. doi:10.2305/IUCN.UK.2016-3.RLTS.T22685533A93078343.en. Retrieved 23 December 2017. ^ "Platycercus/Barnardius – Rosellas". Avian Web. 2006. Retrieved 9 August 2016. ^ Forshaw, Joseph M. (2006). Parrots of the World; an Identification Guide. Princeton University Press. ISBN 978-0-691-09251-5. ^ Lendon, A. H. (1973). Australian Parrots in Field and Aviary (2nd ed.). Sydney, Australia: Angus and Robertson. ISBN 978-0-207-12424-2. ^ Falla, R. A.; Sibson, R. B.; Turbot, E. G. (1966). A Field guide to the birds of New Zealand. London, England: Houghton Mifflin and Company. ISBN 978-0-00-212022-7. ^ BirdLife International. "Northern Rosella Platycercus venustus". IUCN Redlist for Birds. Retrieved 9 August 2016. ^ Gill, F.; Donsker, D. (2016). "Parrots and cockatoos". IOC World Bird List. 6.4. International Ornithological Congress. doi:10.14344/IOC.ML.6.4. Retrieved 26 December 2016. ^ International, B. (2016). "Lophopsittacus bensoni". The IUCN Red List of Threatened Species. IUCN. 2016: e.T22728844A94998578. doi:10.2305/IUCN.UK.2016-3.RLTS.T22728844A94998578.en. Retrieved 23 December 2017.